of sensitive and person-centred care "
The Moreton Centre has teams of 24 hour specialist staff ensuring the provision of sensitive and person-centred care for vulnerable individuals experiencing various types of mental health needs, including early-onset dementia, alcohol-related dementia, bipolar affected disorder, schizophrenia, MS and Parkinson’s disease. 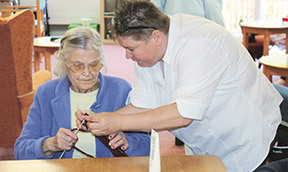 We offer residential and respite care on a short term or long term basis to people (over 35) with dementia and other mental health conditions, varying degrees of challenging and complex behaviour. We use best practice techniques to manage and reduce challenging behaviour. 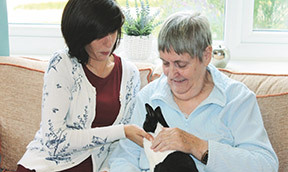 We provide assistance with all aspects of daily living with one to one care if required and as we have a team of general & mental health nurses, we also provide palliative care. So you can be assured that your loved one will not need to transfer to any other facility should their nursing needs change.